MFG Talk Radio published a piece from us where we discussed the top 3 reasons to get a floppy drive emulator. Speaking of our hardware, Modern Machine Shop published a blog on our WiFi USB Connect in April, as well as publishing a piece on the device in their May 2017 issue (pages 136 through 138). MFG News also published a piece about the same device on their blog, as well as in their June 2017 issue in all editions (page 76 for the Southwest edition and page 62 for the West edition, for example). We were the May 2017 Tip of the Month for MoldMaking Technology, which you can check out by going to page 72 of the issue, or check it out on our Instagram account. A recent piece we have done on the top 3 reasons manufacturing jobs are for millennials has been picking up a lot of buzz. MFG Talk Radio published the piece MFR Tech published the piece, and Today’s Medical Developments published the piece. WhyMFG also published it, as well as Manufacturing Global publishing it. Want more information on how to get more OEE and better productivity? Fill out a sales contact form, request a software demo, or call us at (877) 611-5825. Thank you for visiting the Shop Floor Automations blog! Everyone these days has NetFlix, YouTube or Hulu. These platforms provide entertainment, educational programs, “how to” videos, reality programming, and documentaries. Because of the influence of these platforms, the idea came about to make one for the manufacturing industry. Let’s talk about Edge Factor. The introduction video to Edge Factor is a great window into what they do. It starts with the point of view of the parent, the educator and the employer. Manufacturing jobs prove to be the perfect middle ground for the frustrated parent who paid for a child’s education who does not have a job in that career field. It also funnels skilled workers to the employer, while the educator can get the resources they need to teach in this realm. 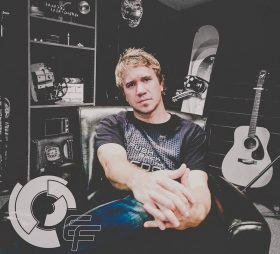 Edge Factor founder Jeremy Bout was a typical high school graduate with no decisions about his future. When he first experimented with manufacturing via a five-axis machine, he said the experience changed his life. The first part Jeremy ever built with a machine set him on a path that would change his life and the lives of others. For Disney, it was all started by a mouse – for Jeremy, it all started with an end mill. “A standard, four flute end mill which looks so simple really became a catalyst for just recognizing that everything is made in using that one tool,” Jeremy says. Read more after the page break below! Shop Floor Automations specializes, among many things, in legacy machines on the manufacturing shop floor. 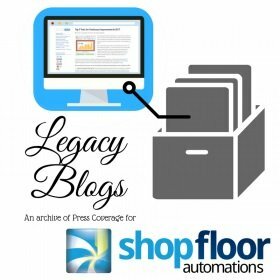 In the same spirit of preservation, we present Edition 2 of our Legacy SFA Blog Series from the Shop Floor Automations blog! You can read the whole article here. The same article was also published in the March 2016 MoldMaking Technology issue on page 47. Recently, Shop Floor Automations made a brand new hire for a new position. Amanda came on board as our Digital Marketing Coordinator (she is now simply our Marketing Coordinator) and AMT (the Association for Manufacturing Technology). As a bit of a throwback, Advanced Manufacturing (formerly known as Manufacturing Engineering Magazine) published this piece on us in October of 2014. 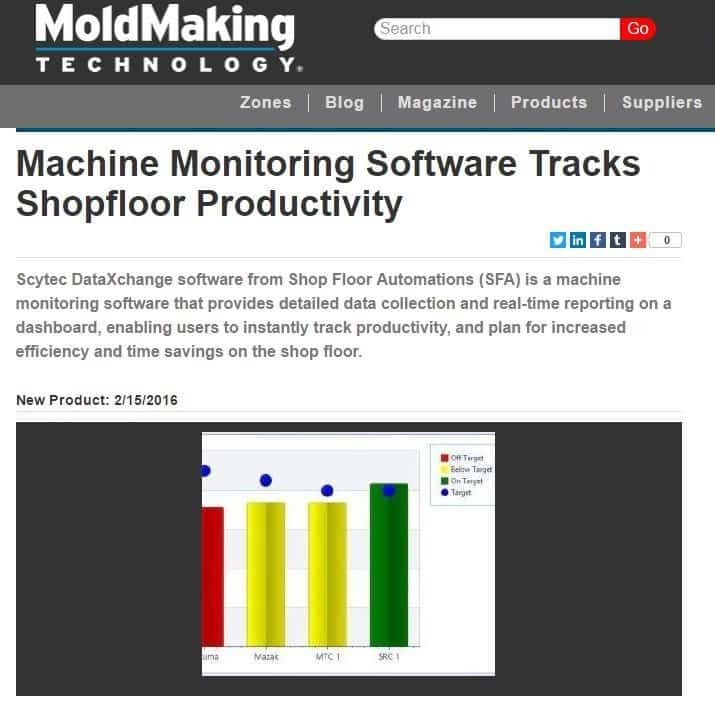 Patrick Waurzyniak writes “More people than ever are looking to automate their processes, said Greg Mercurio, president of Shop Floor Automations Inc. (La Mesa, CA), a reseller of Predator Software’s manufacturing data collection suite and of the cloud-based Scytec data monitoring solution. ‘Time is money, and now there’s more in-process probing and automatic collection of data,” he add. “The key is everything is done at the machine tool.’” You can Read more. Want more information on the solutions we offer? Call us at (877) 611-5825 or chat with us on social media! We are excited to see our company’s press release featured in MoldMaking Technology, the most comprehensive magazine for mold, tool and die shop managers. Check out the article on MMT’s website or read our full press release below. La Mesa, CA – January 28, 2015 – Shop Floor Automations (SFA), a leader in automation solutions and technology is excited to announce the release of a new product version of Scytec DataXchange Software. 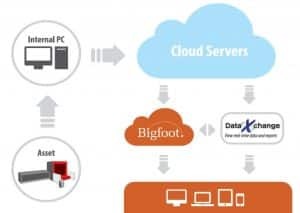 DataXchange is simple and easy-to-use machine monitoring software that can increase efficiency and save time on the shop floor. Detailed data collection is no problem with a monthly billing system and no long-term contracts. DataXchange also offers real-time reporting presented on the user dashboard in order for shop owners and operators to instantly track productivity and plan for increased efficiency in their shops. DataXchange version 2016.01.27 offers new features and functionality. With the addition of an Application Program Interface (API), DataXchange can easily integrate with other software and hardware. Additionally, new charting and reporting functions have been introduced as well as enhanced MTConnect communication. Featured in the photo, the new Target Utilization chart displays the desired utilization number next to the actual utilization for each piece of equipment. Colors are used to identify how close the actual values are within the defined targets. With an improved interface and Data Entry Screen, Scytec DataXchange is truly a state-of-the-art tool that no machine shop should operate without. Tel: 619-461-4000, fax: 619-461-5918, toll free: 877-611-5825. La Mesa, CA – November 16, 2015 – Shop Floor Automations (SFA), one of the largest independent CNC Automation Suppliers for Predator Software has now released Predator Touch HMI, a new addition to our software line. This new Windows application is a touch-first HMI, Human Machine Interface, designed to replace shop floor bar code readers, QR code readers and handheld terminals. The simplicity of this new software allows machinists and operators to control with ease and little training. The touch-first interface simplifies real-time manual data collection and direct numerical control. Touch HMI also supports data collection for machine downtimes, scrap reasons, and more. Running on almost all Windows editions, Predator Touch HMI is easy to install and begin improving manufacturing processes and operations. Predator Touch HMI has many features including the ability to create an unlimited number of shop floor applications. This software also includes three different button types with the touch-optimized interface. Additionally, there is no install required and it can be integrated with other Predator applications as well as other third-party apps. Touch HMI has the ability for wired or wireless support as well as configuration to communicate with CNCs, CMMs, test stands and other devices. With an affordable site license, Predator Touch HMI is a valuable tool in the automation of machine shops. 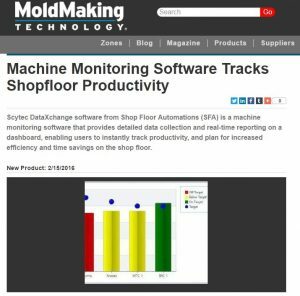 La Mesa, CALIF – June 9, 2015 – Shop Floor Automations (SFA), a leader in software solutions for the manufacturing shop floor, has continued to rank #1 in Predator software sales for 15 years running. This accomplishment is credited to the SFA team due to the dedication and quality customer service. This honor recognizes Shop Floor Automation’s achievement as Predator Software’s top revenue-producing reseller for the past 15 years. The company is frequently required to go through certification and training at Predator Software Corporate Office in Portland, OR. This hands-on training consists of install, troubleshooting, implementing, and best practices for the complete line of the Predator Software Suite. SFA has also been involved with new product development and features for enhancements to existing products in beta testing and new hardware solutions. As a service center and training center for Predator Software, SFA continues to show dedication, technical skills, new methods of implementation and connectivity to the manufacturing industry using CNC machines and other types of equipment. Onsite training is provided at customer locations as well as SFA’s corporate office in La Mesa, about 10 miles near San Diego, California. La Mesa, CA – March 16, 2015 – Shop Floor Automations (SFA), one of the largest independent CNC Automation Suppliers for the CNC Machine Tool Industry has enhanced the LAN Connect product to add Ethernet to any CNC machine. 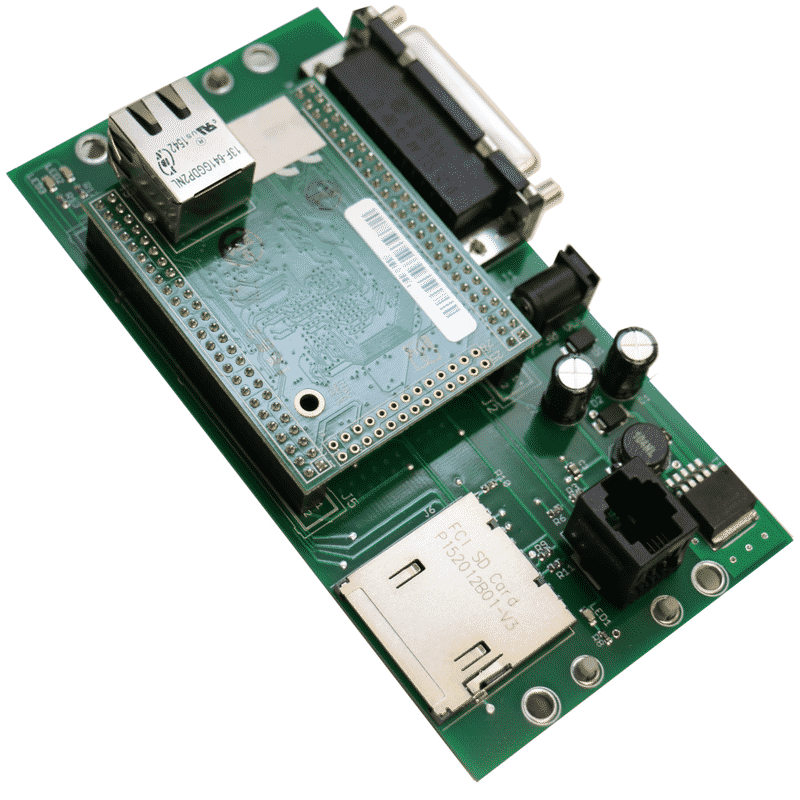 The LAN Connect device acts as an interface between commercially available SD flash memory and any CNC control with an available RS232 port. Machine tool files can be sent from CNC memory to the LAN Connect device, SD memory to CNC memory or drip-fed (DNC) from the SD memory. Flexible CNC communication firmware is built into the unit allowing connection to just about any machine tool control. The LAN Connect device contains all the necessary hardware to integrate a universal display onto a CNC machine tool pendant. The controller is DIN rail mountable inside the pendant or can be reverse mounted on the display. A two (2)GB SD card is included and be upgraded by the end user to any size or brand desired to support larger NC programs/storage capacity. Read more below. 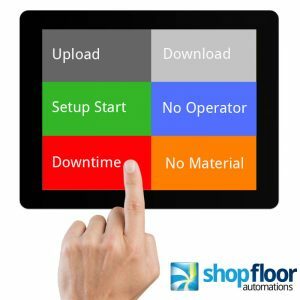 Shop Floor Automations announces a new solution for Machine Monitoring utilizing MTConnect, FOCAS and other solutions called CNC Service (originally an article in CNC West). LA MESA, Calif. – December 16, 2014 – Shop Floor Automations (SFA), the largest distributor and Service Center for Predator Software Inc., today announced the release of Predator’s popular Manufacturing Data Collection (MDC) software for Ethernet-based machine tools. 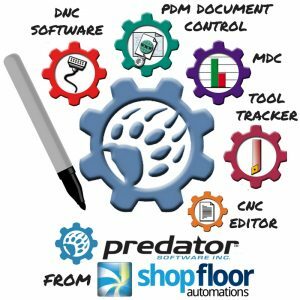 For many years, Predator has offered its fully automated, real-time MDC system for any size company to monitor and improve shop floor productivity using PLCs, macros, and paper-based solutions. This solution integrated well into equipment with stack lights and older machines to capture running, alarms, feed hold, and idle time, but left some users objecting to adding more equipment due to the costs of hardware requirements. Today, most CNC machines include Ethernet ports and can be leveraged for data collection. CNC machines that use a Fanuc controller may have a feature called FOCAS, which allows for the capture of real-time data such as overrides, spindle speed, program number, feed/speed rates, alarms, and indicates control mode. Read more below. There is a good article about CMMS (computerized maintenance management system) from Bigfoot CMMS in the April 2014 edition of Production Machining. Shop Floor Automations provides an excellent solution for those needs. Automation is what is propelling manufacturing today, and I’m not only talking about machine tool automation. Automation can and does occur in the office as well with the implementation of shop management software and tool data management software. A computerized maintenance management system (CMMS) is one example of a tool that automates preventive maintenance schedules on shop equipment. This system can improve the bottom line through increased labor efficiency, enhanced asset effectiveness, certification assistance with government agencies and certifying organizations, liability protection and more. A CMMS monitors pressure, temperature, voltage and hours run and help operators communicate when maintenance should be completed. It can also track equipment history and grade performance over time. The software can reduce equipment downtime, minimize equipment and cost repairs, maximize equipment reliability and increase efficiency. Read “Investing in a Computerized Maintenance Management System” for more information about the CMMS. Founded back in 1998, Shop Floor Automations, Inc. (SFA) started as a small company focused on distributing the Predator Software product line to the San Diego and Los Angeles markets of California. Within 6 months, the company expanded to cover the entire West Coast as a reseller with the goal to be the #1 reseller in a year. The goal was met in 1999 when SFA was awarded the status of the largest distributor of Predator Software in North America. SFA has been ranked #1 in Predator Software Sales, Service and Support for the past 15 years running. 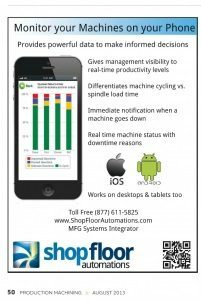 SFA has become the industry leader in Shop Floor Communications and Machine Monitoring Solutions. Totally redefining what “Shop Floor Automation” solutions should be. With thousands of customers from across the United States, Mexico, Canada, Europe and Asia, SFA was called upon by other vendors to provide other solutions that could be met by our knowledge, support and sales experience of the manufacturing industry. In 2010, SFA aligned itself with these vendors to close the loop with maintenance management software, job management and scheduling software, hardware manufacturers, and machine tool companies.